Musicians deserve to be seen outside of the usual third party serices like spotify, and the best way to do that is by setting up a decent site showcasing everything from photos, press, bios, etc. In today’s post, we are listing 20 of the best WordPress themes for musicians. Please note that the list is not arranged in any particular order. We like them all as we’ve picked them from A LOT of available options out there. A quick word on hosting before we get started, for your site to work smoothly, without downtime, and with good performance, you’ll need some decent hosting. So don’t forget to research the best WordPress hosting providers before deciding on anything else (maybe aside from the actual domain name :)). Quick installation – Most of the themes included in this list come with sample websites that can be cloned and used immediately as your own (of course you can also customize them). If not, the themes at least have easy-to-use tools that will allow you to set up your website easily (without using codes). Plugin compatibility – We chose themes that are compatible with popular WordPress plugins – so, you can choose to install plugins that are suitable to your particular needs. Layout options – We want you to have several options in designing your website. Media player – You can choose a theme that allows you to embed audio/ video players on your site. Shop support – A theme that supports e-commerce will make it easy for you to sell your music and products (t-shirts, memorabilia, etc.) online. Musicians and anyone in the music industry will find the MusicFlex WordPress theme useful in building an online presence. You can create a simple or elegant website with this theme as it’s flexible and loaded with a lot of features. Listed below are some of its top features. 1-Click demo installation – The theme has sample websites that can be cloned and made your own. WPBakery plugin – This drag and drop page builder is included in the package. Slider and Grid elements – You can display posts on pages as well as shows, new releases, band members, and their profiles. Shortcode for release information – Information such as track lists, purchase links, release date, etc. can be easily included. Touring schedule element – Tour dates can be included and viewers can use the filter function to check past and future shows. Timeline element – Your band’s history can be displayed in a timeline pattern. Translation ready – The theme is compatible with WPML and Polylang. It also comes with a .pot file. Instagram feed – There’s a plugin that supports this function. MailChimp plugin – The theme supports shortcodes for this email marketing plugin. Typography elements – The theme comes with hundreds of fonts that you can use in designing your website. Teaser boxes – You can highlight some of your activities in sections. 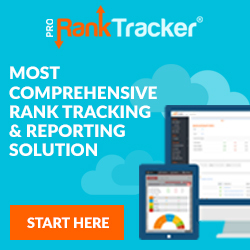 Counter – You can enable the counter feature so that you can monitor the number of visitors that are going to your site. Social Networking element – Easily share your content on social media. You can use the MusicFlex WordPress theme on all types of genre – rock, hip hop, pop, jazz, R&B, classical music, and what have you. It’s highly customizable to fit your specific needs and is optimized for mobile use. Header logo option – You can opt to upload your own logo when creating the header section of your site. Blog layouts – Choose from 2 different layouts when creating a blog page. Sidebar style – The theme comes with a right sidebar option. Page size – You can go for full-width page size. Google fonts – Use any of the existing fonts found in the Google font library. Live customizer – You can watch a preview while making changes in settings (colors, fonts, etc.). Icon compatible – The theme supports the Font Awesome plugin. Page comment – You have the option to show or hide comments on your posts. Typography – Get access to hundreds of fonts from the theme and Google’s font library. 1-Click demo installation – You can import the sample website included in the theme’s package. Responsive layout – The theme is compatible with all major devices. SEO optimized – You can use today’s most popular SEO plugins with the theme. Custom footer – The footer can be edited and customized to fit your brand’s requirements. 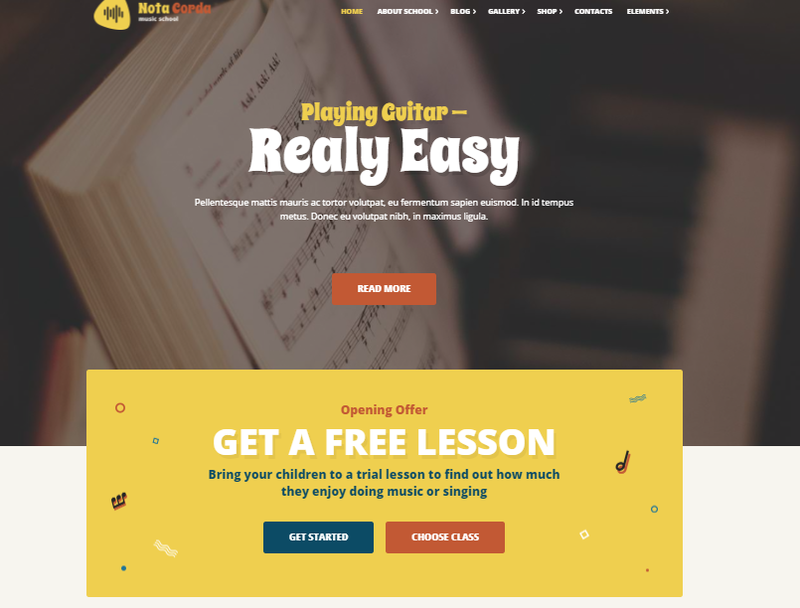 As you can see, the Musisi WordPress theme can provide for a functional design for your website. You can give information about your band (or yourself, if you’re a solo artist) and create photo galleries, event schedules, blogs, and more. FlexSlider – The theme comes with a slide maker that allows you to create slides on your homepage. Homepage layout – You can customize the look of your homepage from the back-end. MP3 design – MP3 files can be streamed on your website. Display options – You can include images and videos in your posts. Tour dates – The theme carries a function wherein you can display your tour dates on your site. Blog – You can create a blog section on your website. Page templates – Templates for the different pages on your site are provided in the theme. WooCommerce integrated – You can sell anything on your website. Custom widgets – The theme carries its own widgets for certain functions. Custom logo – You can opt to upload your own logo at the header section. Translatable – Create a multilingual site by installing a translation plugin. Auto image resize – The theme will automatically resize images uploaded in the gallery. HTML5 audio player – Songs can be played within your website. Dropdown menus – The theme supports multilevel menus. Full documentation – Get a PDF file of the theme’s set up instructions. 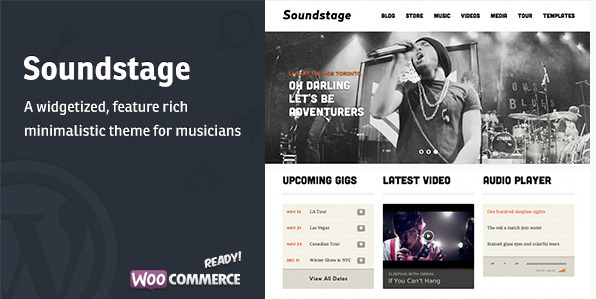 You can create an impressively designed music website with the Soundstage theme. It has everything that musicians and artists need to bring their message to the world. Homepage variations – Working at the back-end of WordPress will allow you to create unlimited possibilities with your website’s design. Post types – You can create posts on artists, events, galleries, and more. Event management – The theme allows musicians to manage events within the site. Logo customization – You can opt to upload your own logo on the header section. Slider Revolution – You also get this premium slide maker for free when you purchase the theme. Parallax and CSS – Include animations and 3D effects on your site’s design. Shortcodes generator – This feature allows you to create elements for designing your website even if you don’t know a thing about coding. WooCommerce support – The theme is compatible with this e-commerce plugin. Fonts – Aside from the theme’s custom fonts, you can also access Google’s font library. Responsive layout – The theme is designed to be highly functional for music-related layouts. Font Awesome icons – Get access to hundreds of font icons that you can use in designing your website. Color options – Use unlimited color combinations to design your website. Retina ready – High-resolution devices are compatible with the theme. Custom widgets – Built-in widgets are included in the theme. Theme options – Every element of the theme is highly customizable from the back-end. 1-Click demo installation – You can use the theme’s sample website design and go on from there. You can create a minimalist but functional website design with the Steve Cadey WordPress theme. If you want to showcase your works this way, this theme can be one of your options. The Flicker WordPress theme makes for a great choice for musicians, music-minded people, and music lovers of all genre. You can consider this theme if you’re planning on promoting your band, solo career, or music in general. It comes with a lot of important functions that will let you present your work and craft to a worldwide audience. Some of the theme’s features are listed below. Unyson framework – The theme has a solid framework that you can build your website on. Unyson page builder – You can use the theme’s drag and drop tool in moving elements around your website’s design. Layout options – You can choose the wide or boxed version when creating the overall layout of your site. Color schemes – The theme comes with 3 pre-defined colors that you can use in designing your website. However, if you want to use your own shades of colors, you can use the theme’s customizer tool to do so. Header options – You get to choose from several design options when creating the header section of your website. Fonts – The theme allows you to access Google’s font library (it contains several hundreds of fonts). Font Awesome icons – You can use icons in defining the functions of your site. Cross-browser compatibility – The theme looks good on all major browsers. Full documentation – Get detailed explanation on how to use and install the theme. Support – Should you encounter problems with the theme, the theme’s developer will help you sort things out. 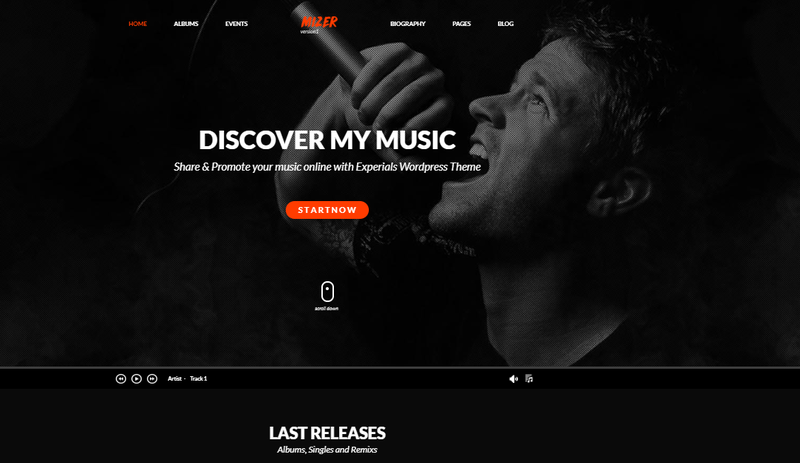 You can use the Flicker WordPress theme as a reliable tool in spreading information about your music and activities related to your work or interest. It comes with all the basic features that you need to have an informational and entertaining website. 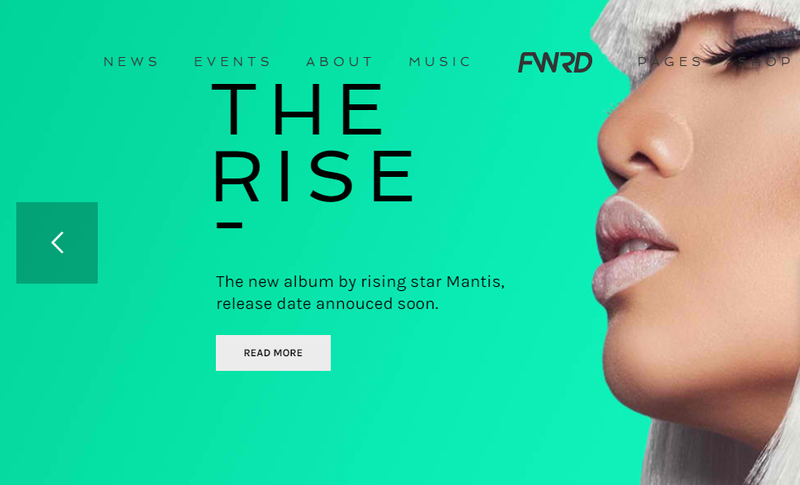 If you’re looking for a minimalist WordPress theme for your music website, the Lush theme is worth considering. Whether you’re a singer, songwriter, producer, pianists, guitarist, drummer, or simply interested in music, this theme will work for you. Read on to find out some of the theme’s features. 1-Click demo installation – You can opt to copy one of the theme’s sample websites. Visual Composer – Use this page builder to quickly set up a website from scratch. WooCommerce integration – You can sell music or any other product on your website through this e-commerce platform. Gigs manager – You can create events and enable the countdown function. Custom widgets – The theme comes with its own set of widgets carrying different functions. Information element – You get to choose how much information to put out regarding your music. Event flyer and poster – You can include information on dates, venues, etc. Music player – A music player can be included in your site’s design to allow users to listen to your songs. Portfolio section – You can place band photos or any images in the portfolio section of your website. Upload option – You can upload bulk photos for your photo albums. Audio player – Song playlists can be managed with this feature. Links – You can include links on where to purchase your music (and other products). Embed function – The theme allows video links to be embedded on the site’s pages (e.g. YouTube, SoundCloud, BandCamp, etc.). Unlimited layouts – You get to configure the website’s settings at the back-end of WordPress (fonts, colors, etc.). Parallax effects – You can include eye-catching effects into your site’s design. Your imagination is the limit when you decide to create your website using the Lush WordPress theme. It’s the type of theme that can cater to every music lover’s needs. What’s more, you don’t need any coding skills to use this. Sticky header – You can enable this feature if you want to keep the header visible at all times. Hot links – You can include social media links and outside links on your pages. Video background – You can include a video as your background. Parallax effects – Parallax effects can be set on all your pages. Custom header – You can use your own logo or Google fonts in creating your site’s header. Scroll effects – You can design your website with scrolling effects. Image divider – The theme comes with a widget that functions as a divider for separating sections of content. Responsive layout – Your website will look good on any type of screen. Pagination system – The theme’s package includes several options on how to manage pages (e.g. infinite scroll). Page design options – Images can be used independently on the background and on sidebars. Audio player – You can place playlists on your website to allow users to listen to your music while on your site. 1-Click demo installation – You can import the theme’s sample data to copy the included dummy website. Translation ready – The theme is compatible with WPML and other popular translation plugins. MP3 player – You can include this in your site’s design so that MP3 files can be played while visitors are browsing your website. Photo Album – The theme is designed with the capacity to upload bulk photos. As you can see, the FWRD WordPress theme has a lot of customization options in designing websites for musicians. You can, therefore, build a site according to your specific needs. 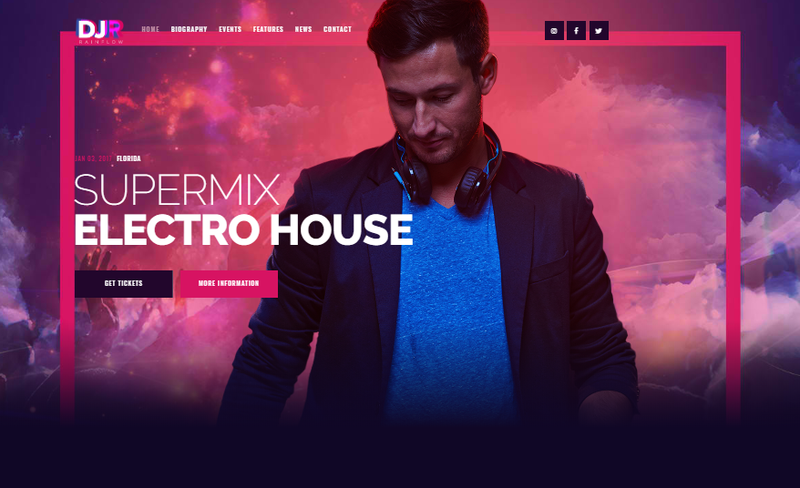 If you are a musician searching for a theme that can produce a stylish and functional website, the DJ Rainflow WordPress theme is worth looking into. You can include all types of information with this theme and even include photo galleries, videos, and effects into your site’s design. Check out its most notable features below. Homepage layouts – You can choose from 3 options in displaying your content. Contact Form – The theme’s package includes a working contact form. 1-Click demo installation – You can clone a dummy website included in the theme. AJAX search – There’s a search function within the site. Typography – You can use any of the hundreds of fonts accessible with the theme. Shortcodes generator – You can design the theme even without coding as the theme has a built-in shortcode generator. HTML5 and CSS3 – The theme is well-coded and structured to run smoothly. Flexible colors – You can use any shade of color in designing your website. Page layout – Your web page can acquire a full-width or boxed look. Blog options – The theme allows you to can create a blog using different styles and options. Post views – You can enable this option to display the number of times your posts have been viewed. Like button – Include the like button to interact with your audience. Sharing buttons – Make sharing on social media easily by having sharing buttons accessible to your site visitors. Custom widgets – The theme’s own widgets will add more functionality to your website. Responsive design – Using the theme will make your website accessible on all major devices. 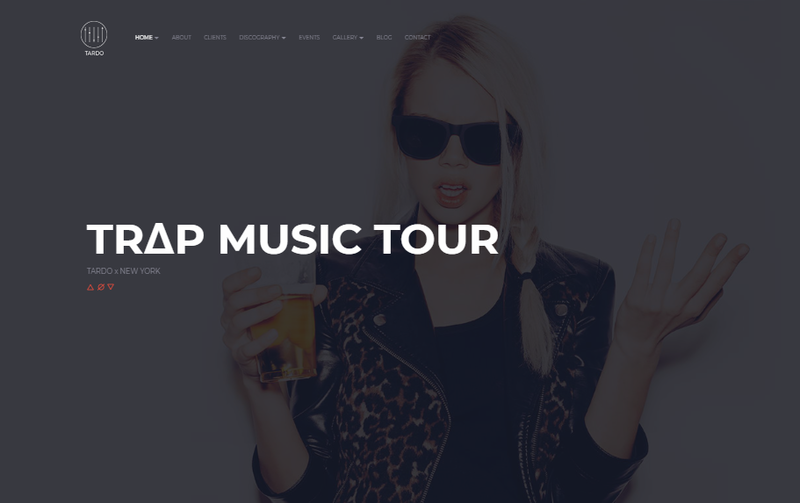 The DJ Rainflow WordPress theme can create a professional-looking website for musicians. You will find that it’s a very flexible theme as it comes with a lot of customization options. Music bands, solo artists, DJs, and other music-oriented people will benefit from using the AQURA WordPress theme in creating their website. With its many customizable features and tools, you can easily put up a working website even if you don’t have coding skills. Look at some of the theme’s features below. Post styles – Your posts can include galleries. Integrated search – People can search particular posts on your website by using keywords. Parallax effects – You can include 3D effects to highlight some of your content. Music sections – The theme carries elements that would let you display your music on different areas of your website. Image display – You have the option of displaying full-screen images or photos. Typography layout – You can use different styles of fonts in designing your website. Retina ready – The theme is compatible with high-resolution devices. Responsive layout – Your website will be nicely viewable from all major devices. Social Media synchronization – You can connect your website with your social media accounts. WooCommerce support – The theme is compatible with this e-commerce plugin and will, therefore, allow you to put up an online shop on your website. Cross-browser support – This theme is compatible with all major browsers. Full documentation – Detailed instructions on how to set up your website using the theme are included in the package. As a musician or web designer, you have everything you need in the AQURA WordPress theme. As you can see, it has tools for designing a website that will function according to your desired purpose. It also comes with user-friendly controls to allow your creativity to flow naturally. In the end, even your site visitors will appreciate the design and functionality of your website. Singers, bands, artists, and people in the music industry looking out for a WordPress theme to create their websites will find the Sonorama a worthwhile candidate in their many choices. It’s one of those themes that can help you present your sound and creations on the internet and reach your audience from all across the world. Below is a list of some of the theme’s top features. Visual page builder – The theme’s package includes a drag and drop tool for arranging elements on your web pages. Styling customization – You can customize your site’s background, navigation styles, colors, etc.). Pre-defined color schemes – You get at least 16 pre-defined colors with the theme. Parallax effects – The theme allows for the inclusion of 3D effects on every page of your website. Responsive design – Every element on your website will look good and load well on all major devices. Valid HTML and CSS3 – The theme is structured and coded to perform well on different types of devices (PCs, laptops, smartphones). Clean coded – Web designers can work on expanding the theme. Cross-browser support – The theme is viewable (and will look good) on all major browsers. Retina ready – High-resolution screens will be able to view sharp graphic images on your website. Full documentation – The theme’s package includes a tutorial video for setting up the theme. You can create a clean, beautiful, and functional website with the Sonorama WordPress theme. You can configure everything at the back-end of WordPress – there, you will find tons of options for customization. Page options – You can either create a one-page or multipage website. Audio player – The theme allows you to place an audio player on your site so that your visitors can play music while they’re on your website. Styling customization – Going to the back-end of WordPress will allow you to tinker on the theme’s settings. Background options – You can use images, colors, or patterns as background. Responsive design – All the elements on your site will look good on modern devices. Valid HTML and CSS3 – The theme is well-structured and well-coded to handle complex designs. Clean code – The theme’s code is expandable. Retina ready – Text and images will appear sharp on high-resolution devices. Parallax effects – Each page and section on your website can include 3D effects. Cross-browser support – The theme is viewable on all major browsers. Full documentation – There’s a video tutorial on how to set up your website with the theme. Support – Should you need assistance in setting up your website, you can contact the theme’s tech support to help you. You can create a modern music-related website with the Dezibel WordPress theme. It comes with customization options that let you design your website just the way you like it. The Musiq WordPress theme offers users with infinite possibilities on how to set up their websites. It’s particularly useful for music-oriented sites as it’s especially designed for said purpose. Look at some of the theme’s features below. Page style – Choose from one-page or multi-page website. Audio player – Your site visitors can listen to music while on your website. Music album – You can create a discography page. Video support – Videos from popular sites like Spotify and SoundCloud can be embedded on your posts. Visual Page builder – This drag and drop tool will allow you to move elements around and end up with the design that you want. Styling customization – You can find all the customization options at the back-end of WordPress. Background options – You can opt to use colors, images or patterns as background. Responsive layout – Your content will load quickly and clearly on all major devices. HTML5 and CSS3 – The theme allows for the use of animation effects. Color Styles – The theme’s package includes unlimited use of colors. PSD files – You get the theme’s PSD files to use according to your needs. Cross-browser support – The theme is compatible with major browsers. Clean code – Web designers can further expand the theme and will find such task to be easy. Retina ready – High-resolution devices can display graphics beautifully. Parallax effects – You can include 3D effects in your site’s design. As its name suggests, the Muziq WordPress theme can indeed create a beautiful and well-functioning website for musicians and other music-related purposes. It comes with templates and customization options that make web designing really easy. Homepage layouts – Choose from 2 styles of layouts. 1-Click demo installation – The theme comes with sample websites and you can copy one of them in creating your own site. Layout features – You can create a full-width or boxed layout. Header styles – The theme allows you to create your own header style, but it also has pre-made ones. Multi-functional panel – The site administrator can enable or disable this feature for different users. Styling effects – The theme’s package includes the ability to add parallax effects, hovering effects, and JQuery animations. Retina option – You can opt to enable or disable the retina functionality. Swiper Slider – Your posts and galleries can include slides. Revolution Slider – The theme includes a slide maker. Navigation options – Your design can include a main menu and a user menu. HTML5 and CSS3 – The theme is designed to have smooth animations and transitions. Shortcode generator – You don’t need coding skills to set up your website. Cross-browser compatible – The theme is viewable from all browsers. Media content management – This feature allows you to manage your site’s content easily. 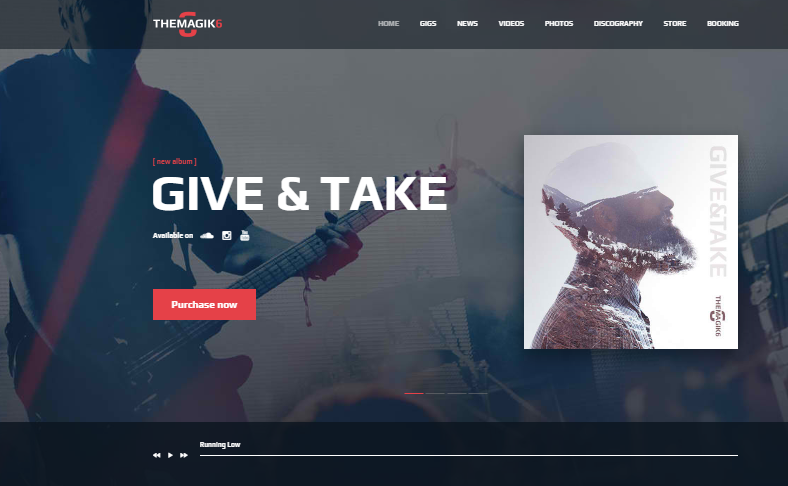 If you want to showcase your music-related works and include galleries, videos, events, etc., consider using the Magic 6 WordPress theme. It’s very easy to set up and you can even clone the theme’s sample website. The theme also includes free updates for life. Slider Revolution – This premium slide maker plugin is included in the theme. Bootstrap framework – The theme is built on a reliable structure and is stable. Responsive layout – You can expect the theme to look good when accessed from different types of modern devices. Theme options – The user-friendly back-end contains all the setting options for you to build your site’s design. Clean code – The theme is cleanly coded to enable expansion should there be a need to do so. Unlimited colors – You can use any color shades and combinations to make your website match your brand’s color theme. Retina ready – High-resolution screens can handle graphics designs included in the website. Update notifications – You will get notified whenever there are updates to the theme. Full documentation – Detailed instructions are included in the theme to help you set up your website. Support – Should you have problems and questions regarding the theme, the theme’s developer has a customer support team to help you out. Beginners and professional web designers will find the Mizer WordPress theme easy to use in setting up a website. It comes with several options and styling layouts to create an attractive and functional site for musicians and related professions. The TARDO WordPress theme works well for music-related websites. And so, whether you are a musician or simply work in a music-related field, you can consider using the TARDO theme when creating an online presence. Look below for some of the theme’s best features. Bootstrap framework – The theme is built on a solid foundation. Visual Composer – This premium plugin uses drag and drop interface in building your website. Responsive design – The theme’s layout is made to be viewable on modern devices. Events Manager – Easily manage tours, dates, and other types of music events. Discography – Build your discography as your music accomplishments grow. Audio player – Create an unlimited playlist of songs on your website. Photo gallery – Include images of yourself, your band, and events. HTML5 and CSS3 – You can include animations on your site. Theme options – Customize your website’s design from the back-end of WordPress. Translation ready – The theme supports WPML and other translation plugins. The package also includes .po and .mo files. Sample data included – You can use the sample data to set up your own website. Google Fonts – Get access to hundreds of Google fonts through Google’s font library. Contact Form 7 – This contact form plugin is included in the theme’s package. Google map – You can include Google map in your site’s design. Live Twitter feed – You have the option of including Twitter live feed on your website. Full documentation – The theme includes a video tutorial on how to set up your website. Support – You can contact the developer’s support team for any problem concerning the theme. Music lovers will find the TARDO WordPress theme useful in presenting one’s musical works to the world. It also provides for an easy-to-manage platform for events, promotions, and more. 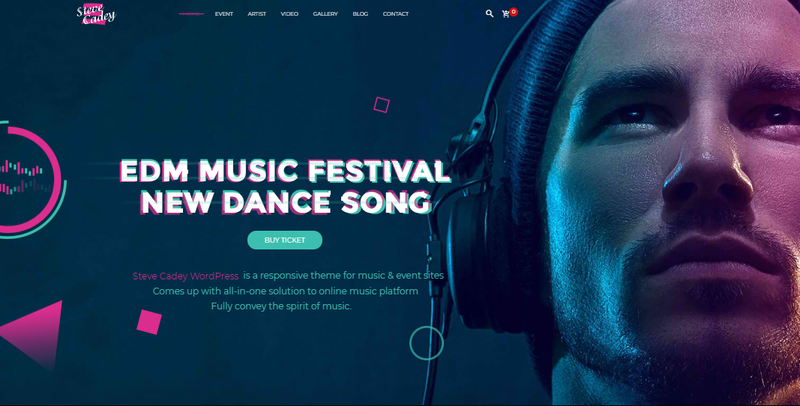 Musicians composed of bands, solo artists, producers, and other related professions and interests will find the Music Beat WordPress theme useful in creating an impressive online presence. With this theme, you can easily put up a website that showcases your music, talent, merchandise, and what have you. Read on to find out some of its best features. Album player – Your site visitors can listen to your album compilation while on your site. Album listing – Present your song listings on your website in an organized manner. Audio/ Video playlist – You can create a playlist of both audio and video tracks. Blockquote – You can showcase your content in blocks for styling effects. Header – The theme comes with header templates that can be customized as needed. Table – You can present your content in table form. List – You can opt to show your songs or albums in list form. Responsive layout – The theme is designed to work well with all modern devices. Skin color – Choose from light or dark version of skin. You can also customize the colors on your site in any way you want. WPBakery – Use this drag and drop page builder to easily set up your website. Silk Slider – Create slides with this plugin. Touch support – Devices that use touch and swipe functions are compatible with the theme. Pages – The theme includes page templates for About, Blog, Gallery, Services, Album, Shop, and more. Message alert – You can enable this function if you want to be alerted of incoming messages from your website. Social Network feeds – The theme comes with automatic feed for Twitter, Instagram, Flickr, etc. Google fonts – You get to use any of the hundreds of Google fonts available in Google’s font library. The Music Beat WordPress theme is easy to set up and customize according to your needs. You can effectively use it to spread information about your music throughout the world. 1-Click demo installation – The theme’s demo website can be cloned and used as your own. Galleries – You can include photos of yourself or your band. Blog – You have the option of including a blog section on your site. Testimonials – You can place testimonials on your pages. Catalog – If you have products to sell, you can display them in a catalog format. Header options – The theme comes with pre-made headers that can be further customized. Homepage – You can use any of the professionally designed homepage layouts included in the theme. WooCommerce support – The theme is compatible with this e-commerce platform (it comes with a shopping cart). Shortcodes generator – There’s a built-in shortcode generator to enable you to design your site without creating codes yourself. Layout options – You can present your content in lists, slides, and tabs. Compatible plugins – The theme is compatible with several premium plugins like Visual Composer, Contact Form 7, and MailChimp. Responsive design – Your website will look good on large and small screens. Parallax effects – You can include parallax effects to beautify your site. Branding option – You can upload your own logo and favicon. SEO ready – The theme is compatible with popular SEO plugins (e.g. Yoast, All in One SEO). Multilevel menus – You can create menus with several sub menus. Cross-browser compatibility – The theme looks great on all major browsers. Full documentation – The theme’s package includes detailed instructions on how to set up the theme. As you can see, NotaCorda WordPress theme is loaded with features to create a truly functional website for musicians. You can design it yourself as it comes with a drag and drop page builder. Of course, your web designer will also find it easy to use. As you can already tell, the Entertainer WordPress theme can create a website for all types of professions in the music industry – not only musicians but any type of artists. See some of the theme’s features below. Page templates – The theme comes with several templates for different types of entertainers. Video templates – You can display videos from sites like YouTube and Vimeo. Podcasts and music – Posts can include audio and video files. Tour templates – You can display tour dates and events dates on your website. Photo options – Promotional shots can be presented on your site. Content slideshow – Your homepage can include a slideshow of your most important content. Customizer – You can configure every setting from the back-end of WordPress. Custom logo – You have the option to upload your own logo for brand recognition. Social Media menu – The theme comes with 2 placements for the social media menu – at the header and at the footer. Compatible plugins – You can use several premium plugins with the theme (e.g. Gravity Forms, WooCommerce, JetPack, and more). Responsive layout – The theme is designed to work well with all types of devices (from desktops to mobiles). Online shop – You can sell products on your website via WooCommerce. Fan polls – You can hold polls and contests for your fans. As you can see, the Entertainer WordPress theme can be used by any profession in the entertainment industry. If you’re a musician, you can pick the specific elements and layouts needed in designing your website. The Loud WordPress theme can create modern-looking websites for musicians and anybody involved in the music business. It’s the type of theme that works right out of the box and can, therefore, be used immediately. See below for a list of some of its main features. 1-Click demo installation – You can opt to copy the theme’s sample website. Admin interface – Working at the back-end of WordPress is easy as everything is presented in a simple manner. Theme options – The theme allows for customization in every aspect of the site. Layout possibilities – You get unlimited layout options as you can tinker with every section of the website. Pre-made templates – The theme’s package includes around 200 ready-to-use templates. WPBakery – The theme includes this premium page builder plugin with additional customization elements. Slider Revolution – You can use any of the pre-made slide templates included in the theme. Homepage layouts – Choose from several layout options for your homepage. Inner page layouts – The theme comes with a lot of layouts for your website’s inner pages. Playlist manager – You can arrange songs in a playlist format. Embed players support – You can include music players from Spotify, BandCamp, SoundCloud, Reverbnation, Mix Cloud, etc. Discography – Your discography section can use different layout patterns such as grid, columns, etc. Events page – The theme comes with several layout options for showcasing important events. Video post type – You can present video files in different layout options. WooCommerce ready – The theme is compatible with this e-commerce plugin for selling products on your website. Shop layouts – Should you decide to include a shop on your website, you can choose from several styles on how to present them. Blog – The theme’s package includes several blog layouts. Sticky menu – You can enable this function if you want your menu to be always visible to your audience. Mega menu – The theme can handle large menus. You can create a professional-looking website with the Loud WordPress theme. As you can see, it comes with a lot of templates, layouts, and options that you can customize according to your specific requirements. If you’re a musician looking for a flexible WordPress theme for building your website, you can take a look at the Glytch theme. Beginners and advanced users will find this theme easy to use as it comes with user-friendly tools that will enable you to put up your website in minutes. Check out some of its features below. 1-Click installation – You can opt to use the theme’s sample website by cloning it. WPBakery – This premium page builder is included in the theme’s package. Layout options – Get unlimited layout options with this theme. Pre-made templates – The theme carries at least 150 page templates. Playlist manager – Your visitors can play music while on your website. Effects – You can use several designing effects (e.g. parallax, zoom, and lightbox). Discography – You can lay out your discography in different styles (e.g. metro, column, grid, etc.). Single items – You can customize the layout for single releases. Events page – The theme allows for the creation of an events page (with all the necessary details). WooCommerce ready – You have the option of selling merchandise on your website. Links options – You can opt to set links that lead to your tracks or products for sale. AJAX shopping cart – You can use the theme’s built-in shopping cart for your e-commerce section. Compatible plugins – The theme is compatible with a lot of premium plugins (e.g. MailChimp, WPML, Contact Form 7, etc.). Blog page options – Choose from several layout options for your blog page. Post format support – Your posts can include text, images, and videos. Social Media integration – The theme’s package comes with built-in links to Facebook, Twitter, and Instagram. Social Sharing – Easily share your content via Facebook, Twitter, Pinterest, Reddit, Tumbler, LinkedIn, and more. With the Glytch WordPress theme, you have all the things you need to create a beautiful, working website. As a musician, all you need to do is design it in a way that will let you showcase your work to the world. Which WordPress Music Theme Should You Go For? Like we said, the list we presented above is a random one – each WordPress theme is good and will work well for your chosen purpose as a musician. We suggest picking the theme that will work for you as a band, solo artist, music producer, DJ, music teacher/ school, or just a music lover.